Cost: $150.00 + $50 Supply Fee ALL SUPPLIES ARE INCLUDED FOR $50! Class size: Maximum 10 students to allow plenty of access to the encaustic stations. Here is what you’ve been asking for: a FULL day of encaustics with Tracy! You’ll create two very fun projects! Spend the day learning and having fun! Whether you've taken a fun "Try it!" 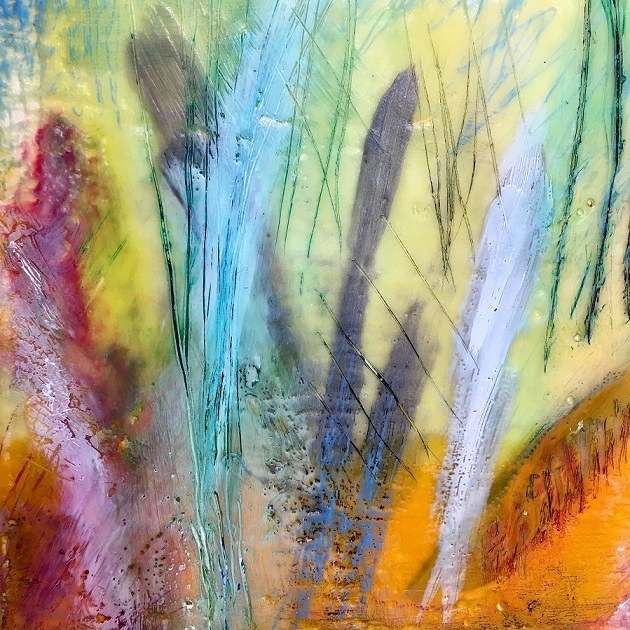 class on a Friday night, or you've never taken an encaustic class before – or even if you have done encaustics with other instructors – this will be a great workshop for exploring Tracy's new and fun techniques in this super versatile medium! She promises to surprise you with some new techniques not offered in the evening “Try-It” classes. What is encaustic? It's creating art with melted, pigmented beeswax! This ancient medium is experiencing a major resurgence. For more information on encaustic, click here. In this 1-day workshop, Tracy will walk you through two exciting projects. You will learn multiple techniques and have plenty of time to play and experiment with new mixed media add-ons throughout the day. Tracy is very generous with supplies, just show up and everything is here waiting for you. That’s right: you won’t have to purchase any art supplies - everything you’ll need is included in the $50 supply fee you pay direct to Tracy upon arrival. For the first project, you will create interesting textures for the hot, melted wax to “grab on to.” The second project starts with a collage. As the day progresses, Tracy will walk you through techniques to add layers of wonderful wax colors and textures to each of the boards. You will leave with two finished projects to show your friends! This workshop is an opportunity to experiment with not only a smorgasbord of encaustics, but also with all kinds of supplies and tools from ARTspot with Tracy! She will show you what other art materials play well with wax, and why. This is a great, and hard to find, workshop if you want to get an overview of how to add wax to mixed media. All Supplies are included in the $50 supply fee. $50 Supply Fee paid directly to instructor. Cash or checks made out to Tracy Felix. If you would like to purchase additional supplies... ARTspot carries a great selection of encaustic materials including Enkaustikos, Jacquard, and R&F products. ARTspot is your go-to Encaustic store! AND as a Cole Gallery student, you will receive a coupon for 10% OFF your total purchase. Use any time after the class.